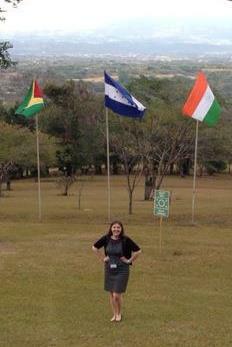 Elena Marmo ’15, Pace University New York City Model United Nations head delegate, at the 2013 UN University for Peace Model UN Conference in Costa Rica. As a political science major and peace and justice studies minor, issues regarding human rights are very important to me. Before participating in the 2013 University for Peace Model UN Conference in Costa Rica, UPeace faculty gave Pace University New York City students a three-day training in contemporary human rights issues. The course, provided by UPeace’s Human Rights Center was an amazing experience. Because I am passionate about learning and am interested in going to graduate school, I was grateful that the University arranged for a group of undergraduate students to learn from professionals working in the field that they teach in. The material was also very relevant and interesting for me as I then represented the Kingdom of Belgium in a simulation of the Human Rights Council. I felt privileged to learn about many critical issues and ideas that individuals on a graduate level study. I am extremely thankful that I was able to spend time on the UPeace campus engaging with material that is relevant to how I interact with the world. I know that I will continue to engage with the ideas presented to me during my time at UPeace and hopefully conduct more research and learning independently or with our faculty at Pace University. To learn more about Pace University’s participation in the Human Rights Council simulation at the UN University for Peace, click here. For more about Pace University’s participation in the UPeace conference generally, including other committees such as UN Women and the Security Council, click here. – Elena Marmo ’15, Pace University New York City Model UN head delegate. This entry was posted in Student Delegate Blogs and tagged Elena Marmo, graduate school, human rights, Human Rights Center, Human Rights Council, Model UN, Model United Nations, MUN, Pace University, Peace and Justice Studies, Political Science, training, University for Peace, UPEACE. Bookmark the permalink.